I had enough sequence shots from my photo session of the kiteboarders at Burrows park, that I tried to do some photo stitching. Now, Photoshop CS4 has a great automated tool for creating a panoramic from a group of digital pictures, using PhotoMerge. However, it has a hard time knowing ignoring the kiteboarder in the picture and trying to align the backgrounds only. So, I had to do this manually. The picture below is actually 10 different pictures merged together and using careful steps of masking each layer with the previous, and ensuring that the parts of the image you want to see come through. The shear size of this image was hundreds of Megabytes before compression. I think that it turned out pretty clean, and there really isn't much banding showing the difference between each image. Here is another using only 4 pictures, and a different kiteboarder. For more sequence shots, please visit the panoramic gallery at the m2 Photography website. 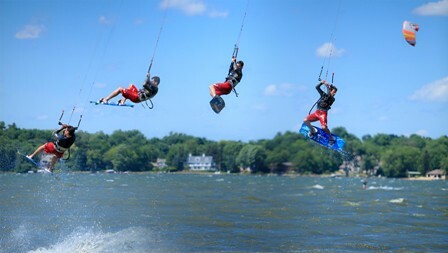 For more pictures and video of Madison Kiteboarders, please visit Kiteriders website. It was a truly epic day on Lake Mendota yesterday. Mother Nature has been holding out on this one, as it was a rare hot and windy day, where the winds were blowing from the WNW at 20-30 mph with higher gusts. I had a chance to shoot some of the kiteboarders who were sailing down at Burrows park, and they didn't disappoint. Here are a couple of shots where the kiter was completely above me, with nothing but blue sky behind them. These were all shot with a 70-200mm 2.8L IS Canon Lens on a Canon 5D Mark II. For more pictures from the Kiteboarding session at Burrows on 06.28.09, click here. To give you an idea of how big the wake was by adding a few "Fat Sacs" to the boat filled with water, the fisheye sort of exaggerates it. I think that we need a few more people in the boat, and go a touch faster to clean up the wake a bit. It didn't really matter though, as we ended up spending more time on the Wakesurfer than we did on the wakeboards. Max will always pose for treats, and it was easy with a few sunchips in hand to get him to look where I needed him to. He's super sporty in his doggles. He usually pulls them off about 5 minutes after wearing them. Great close up of Emily Peternell after getting a face full of water while trying to cross the wake doing the "Superman" pose while riding the wakesurfer on her belly. Riding like this is a whole lot of fun, and can't wait to try it again. Dropping down off the wake, again riding "Superman" style. Jason Peternell, a.k.a. Tapeworm, eating a Twizzlers Pull n' Peel. Capturing him in the boat mirror took him by surprise, but turned out to be a good shot. I took my 1986 Ski Nautique to Janesville today in search of flat water to do some wakeboarding. Emily and Jason Smith met me there and we launched at about 10:30am. Maximus also came along for the ride, and was a great boat dog today. I grabbed my Camera bag, which ended up being almost as fun as the wake sports. Emily and I started taking turns taking pictures using the Canon 70-200mm 2.8L IS lens on a Canon 5D Mark II. The three of us switched from Wakeboarding to Wakesurfing, snapping off 2841 pictures. I spent some time modifying and color correcting images tonight, and have posted my 125 favorites in the Water Sports Gallery. Emily also had a great time playing with the Camera, as it was probably the first time she's shot with a dSLR, let alond multiple lenses. She did great, and we got a bunch of great images. I thought I would showcase a few of my favorites in my photography blog. We also "Attempted" to do some wakesurfing. If you have enough weight in the boat, and you get the wake big enough, you're suppose to be able let go of the rope, and actually surf the wave without being pulled. I didn't have that much weight today, so we just played around on the Wakesurfing board. This shot is me pretending to get "In the Tube," but obviously there isn't much to get under. Here's a close up of Jason charging the wake. Maximus came with us, so I suppose that it's my Father's day treat, even though he's only a dog. We brought along his Doggles for a laugh and got a few poses. I'm also rarely in any pictures, as I'm the one usually behind the camera. I gave Emily a crash course on how to use a dSLR and what the focus point does, and Voila! This might be one of my favorite shots of the day, and the perspective is alot different than the other standard images. Emily is wakesurfing and about to drop in off the top of the wake. There are hundreds of years of lake rescue experience in this photo. Some of these people had not returned to the Lifesaving station for decades. They all enjoyed driving the new rescue boat, and shared stories from the past. This picture was captured during the UW Lifesaving Station 100 Year Anniversary open house. Additional pictures from the Anniversary celebration can be found here. The UW Lifesaving Station volunteered to send over a contingency of Rescue staff to work the Capitol View Triathlon in Madison again this year. We left our pier at 6:30 AM, picked up some rescue boards, and motored over to Governor Nelson State Park for the start of the race. Here are some shots from the event. Getting Instructions before the start. One of the swim buoys marking the path for the Olympic 1500m swim. The water was calm with no wind. Perfect conditions for the swim. One of the triathletes rounding the first marker swimming strong. Only one swimmer did not complete the swim in the alloted time period. The person gave tremendous effort, and would have made it in about 10-15 more minutes. The Lifeguard and rescue volunteers. Verallyn Cline was my Water Safety Instructor in 1991 at the SERF at UW Madison. Since I had just finished her class at UW, and since she was the person who administered the Lifeguard test for the UW Madison Piers, I was able to get a job working at the UW Lifesaving Station as a lifeguard in 1992. Even after all of these years, she is still active in the American Red Cross, and volunteers for the Triathlon each year. Last year, the conditions were not favorable, and the winds were much stronger. At least 1/2 dozen people needed to be rescued in that race, and Verallyn lept off the front of a rescue boat without hesitation. She has been retired for a number years from UW, but still teaches. Amazing, and thought I would post how thankful that she was my instructor which lead to me the best job I've had. More pictures from the Capitol View Triathlon can be found here, at the m2 Photography Website under the Sports Gallery. This is a unique perspective of the University of Wisconsin Lifesaving Station tower that has never been photographed before. I used my Pole Aerial Photography rig to lower the camera from the roof to capture the tower from above. This is the first time I used my PAP equipment in reverse, as normally the idea is to get aerial shots while standing on the ground. Here is a picture of the building, and you can see how high the tower sits above the water. I really like the picture as it shows a special perspective on what we do at UW Rescue. I was up late last night, and decided to practice a little off-camera lighting using my DIY lightbox. The lightbox was created from white foamcore as the structure with large transparency paper taped over the openings to provide that soft lighting for product shots. I don't really sell anything on eBay, but saw this DIY project on the Strobist site, and thought it would be good practice. I chose Ernie from Seseme Street as the model, and tried to use different effects by using different color backdrops and stands. Here is your basic white background lightbox shot. You'll see this "type" of shot everywhere on eBay. The Canon Speedlight I was using on the left-hand side was colorized by using a Rosco gel insert into another DIY project, a Home Depot downspout snoot. It gives the backround a bit of character by adding some color. Changed the background to black, and also set the model on a glossy floor tile, also from the Home improvement store. This adds Ernies reflection into the tile, and makes for a dramatic shot over the plain white. Ernie's cow also wanted to join in on the fun, using the same set up as above. Changed the background to blue, and put a sheet of clear glass under Ernie to get the same sort of web 2.0 reflection. I'm not a big of fan of this one as the glossy black floor tile, as there is a visible line where the glass ends. This on is a combination of the blue background, and black glossy tile. Adds a horizon line, but it's another look. Most of these were shot with a 70-200mm 2.8 IS L lens on a Canon 5D Mark II, using the PocketWizard MiniTT1 and two FlexTT5's holding Canon 430EXII speedlights. Three flashes total, one on the miniTT1, and the other 2 were remotes. The lightbox supplies were purchased from Hobby Lobby and The Home Depot, and cost less than $50.00 to make. The Rosco color gels were purchased from Adorama.com, but can be optained from regional Rosco lighting distibutors. The DIY downspout snoot tutorial can be found here, on the Canon Digital Photography Forums. A version of the DIY Lightbox project can be found here. Additional lightbox picture examples can be seen at the m2 Photography website under the Product Photography gallery. My dog Maximus is one of my favorite models, as he's always willing to pose for treats. Today we tried a new perspective and shot a few with him standing over me from a ledge. To view the entire series from Max's photo shoot today, click here. For more pictures from the Kenosha Outta Sight Kite Flight from Kennedy Park, visit the Aerial Gallery at m2 Photography website. My neighbor just picked up a bullmastif puppy, and I couldn't help but capture a few shots of it. They ended up naming it Kane, after Kasey Kane from Nascar. Their last dog was named Rusty, after Rusty Wallace, so apparently they are really into it. I suggested that they name it Ricky Bobby, and we all had a good laugh. Since puppies grow up so quickly, I knew that these would be memorable pictures on the day they brought him home. Here is a picture of Kane getting accustomed to the new yard. 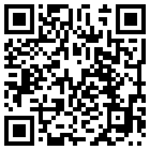 m2 Photography gallery can be found here.